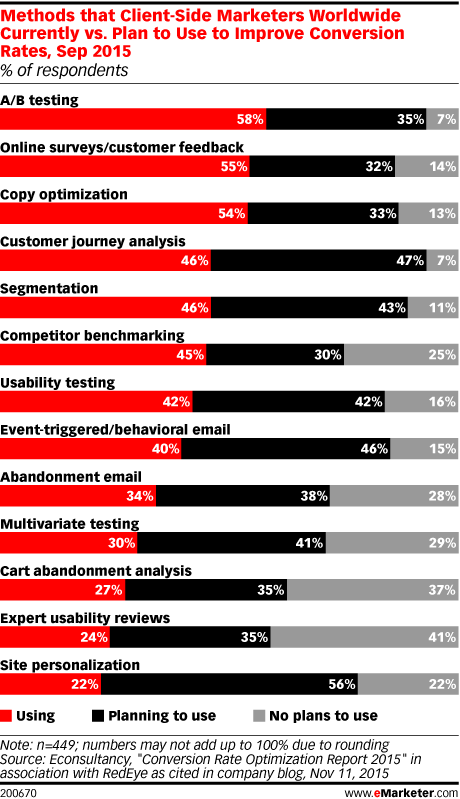 Data is from the November 2015 Econsultancy "Conversion Rate Optimization Report 2015" in association with RedEye. 886 client-side (64%) and supply-side (36%) digital marketers and ecommerce professionals from a variety of industries were surveyed online during July-September 2015. Client-side respondents were from Asia-Pacific (1%), Europe (excluding the UK) (16%), North America (8%), the UK (74%) and other (1%). Supply-side respondents were from Asia-Pacific (3%), Europe (excluding the UK) (24%), the Middle East & North Africa (2%), North America (11%), the UK (58%) and other (2%). Client-side respondents identified their annual company revenues as <£1 million (11%), between £1 million-£10 million (26%), between £10 million-£50 million (17%), between £50 million-£150 million (16%) and more than £150 million (30%). Supply-side respondents identified their annual company revenues as <£1 million (36%), between £1 million-£10 million (40%), between £10 million-£50 million (15%), between £50 million-£150 million (2%) and more than £150 million (7%).